APOL1 risk variants: admixture and MALD. (A) APOL1 risk variants arose approximately 4,000 years ago in Africa and rose quickly to high frequency. In Yoruba (Nigeria), approximately 46% of chromosomes contain either the G1 or G2 allele. 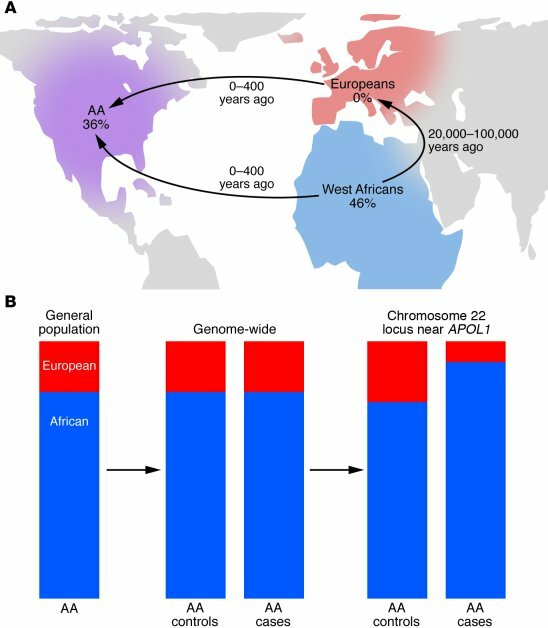 The ancestors of modern Europeans left Africa many millennia before the origin of these risk alleles, so the risk alleles are not found in Europeans. Today, approximately 36% of all African Americans (AA) carry the G1 or G2 alleles. (B) MALD. In the US, African Americans have roughly 80% African ancestry and 20% European ancestry. Since African Americans have much more renal disease than European Americans, MALD tests for chromosomal regions in African Americans with renal disease (cases) that are disproportionately African in origin. Genome-wide, there is no excess African ancestry in renal disease cases. However, at the chromosome 22 locus, there is a marked excess of African ancestry in cases. The odds of this distribution by chance alone are several billion to one (41, 42).